House fires caused by electrical failure! It’s a terrifying statistic but it is confirmed that 25% of house fires are caused by electrical failure! Prolectrical, who are by no means unfamiliar with dealing with dangerous electrical faults, learned recently at ECA #Project18 Roadshow to launch the IET Wiring Regulations 18th Edition! One of the issues the new regulations address is safety! Loose wiring and ageing electrical installations are a key cause of electrical faults which can and do result in burning which can lead to fire. Prolectrical recently had a call out to replace a plug and socket which were damaged by burning caused by loose wiring. 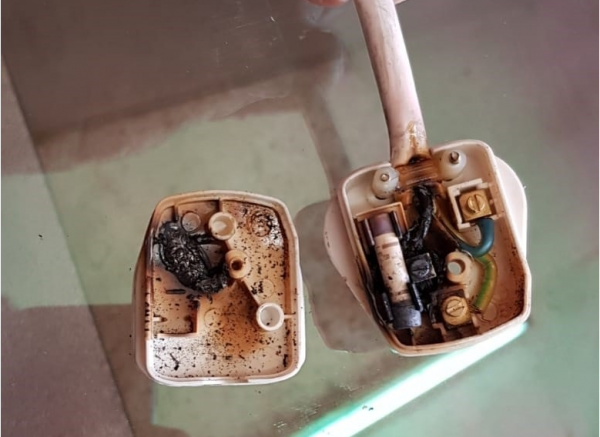 Fortunately for the client involved the burning happened in the plug of an electrical appliance and they were made aware of the situation by the unpleasant smell. They immediately turned of the electrical supply and removed the burning plug from the socket. But it could have been much worse. Another recent close call a Prolectrical customer experienced was with poor wiring of their ceiling downlights. In this case the wiring was hidden in the ceiling cavity. To make matters worse many of the light fittings were touching the wooden joists in the ceiling cavity. The GU10 lamps in the fittings generate a great heat which combined with loose wiring had over heated, burning the ceiling joist. Persistent tripping of the lighting circuit alerted the client that there was an issue with their downlight circuit. The images below show further issues with the poor wiring. The installer, clearly not a qualified electrician. If you are experiencing persistent electrical tripping in a circuit it is important you contact a qualified registered electrician such as Prolectrical to carry out a fault find. For the sake of a call out fee you could avoid a potentially devastating fire. Ageing electrical installations are another big cause of fires. Earlier this year Prolectrical were called out to investigate why an installation was tripping. 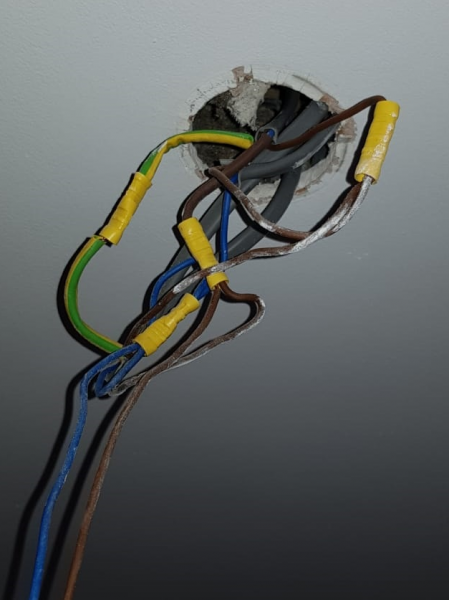 The cables in an old electrical installation which was over 40 years old, were unable to cope with the electrical load required by a modern electrical shower. 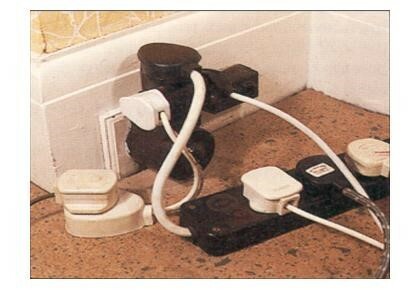 On further investigation of the rented property it was discovered there were only two double sockets per room. In the living room the tenant was running eight electrical appliances including three heaters via extension cables from one double socket. The power required from two of the electric heaters alone exceeded the current load the socket was able to carry. Overloading a socket will cause the plug in the socket to over heat which will in time cause burning and eventually fire. To keep your house safe from overloading sockets you can visit the website www.electricalsafetyfirst.org.uk in the guides and advice section you will find more information on overloading sockets. There is even a socket overload calculator (https://www.electricalsafetyfirst.org.uk/guides-and-advice/around-the-home/overloading-sockets/) which you can use to see which appliances can run safely in a socket at any one time. If you are worried about poor wiring, circuit tripping or over loaded sockets please click here and get in touch with us and we can arrange a time to come and assess the condition of the wiring and advise on the correct remedial action to be taken. Remember always use a qualified electrician to carry out your electrical work. Keep you home safe. Don’t risk being one of the 25%!